Last night before bed, I was playing the 'I can't POSSIBLY still be contagious, I should probably go in to the office tomorrow' game. Because I had just taken my nightly dose of prescription pain medication for my Usual And Customary hip/back pain, AND a snort of Afrin. Then, at 2:24 in the morning...ping! Sweating. Sneezing. Congested. Headache. Chills. Ugh, hot! Chills! Hot! CHILLS! HOT!...achoo!-hack-hack... (repeat for four VERY long hours, because do I have sense enough to just GET UP? Of course not! No, I'm just SURE that I am going to get back to sleep any second now, because I'm so damned tired. That this has seldom ever happened without chemical assistance never enters my mind. And then it was time to get up, so I did. And I am epic-tired and will probably take an actual sick day today. Because brain dead and SQL Server don't mix well. And my daytime decongestant isn't WORKING, and I don't have any clean JEANS, and none of my favorite SOCKS are clean either...I mean, REALLY. Could this day get any less pleasant?! Eeeeeeeeee! 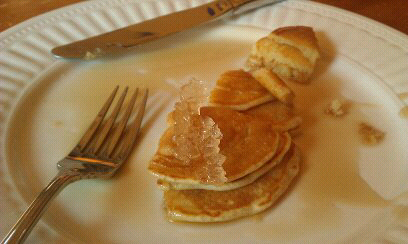 I gots the 'last of the maple syrup' rock candy! Mmmm....maple sugar candy is the best thing EVER!!! Feel better soon!